Low doses of existing drugs may pose new therapy, suggests mouse research from UW pharmacology group. A well-known class of drugs used to treat anxiety and epileptic seizures might provide a new therapeutic approach to managing autism. This prediction is based on mouse studies reported in the March 19 issue of the CELL journal Neuron. William Catterall, UW chair of pharmacology, is senior author of the new autism research. “These are very exciting results because they suggest that existing drugs, called benzodiazepines, might be useful in treatment of the core deficits in autism,” said senior author William Catterall, professor and chair of pharmacology at the University of Washington. These deficits include repetitve behaviors and difficulty relating to others. The condition is often accompanied by specific learning problems. Catterall explained that a particular, well-studied strain of mice acts in ways that resemble these autistic traits. Scientists are interested in their brain chemistry. Normally, inhibitory nerve cells in the brain send chemical signals that put the brake on excitatory nerve cells. Research conducted in this mouse model suggests that they have reduced activity of inhibitory neurons and increased activity of excitatory neurons in the brain. In the study, scientists restored the balance with low, nonsedating doses of benzodiazipine. In addition to finding that mice with autistic characteristics had an imbalance of inhibitory and excitatory neurons in their brains, Catterall and his team found that reducing the effectiveness of inhibitory neurons in normal mice also induced autism-related deficits in social behavior. Classical benzodiazepine drugs had the opposite effect. They increased the activity of inhibitory neurons and diminishing autistic behaviors. “Our results provide strong evidence that increasing inhibitory neurotransmission is an effective approach to improvement of social interactions, repetitive behaviors, and cognitive deficits in a well-established autism animal model that has some similar behavioral features as human autism,” Catterall said. Therapeutic approaches to treat autistic traits in animal studies or in clinical trials have primarily tried to reduce the activity of excitatory neurons. Such efforts have had only modest success to date. 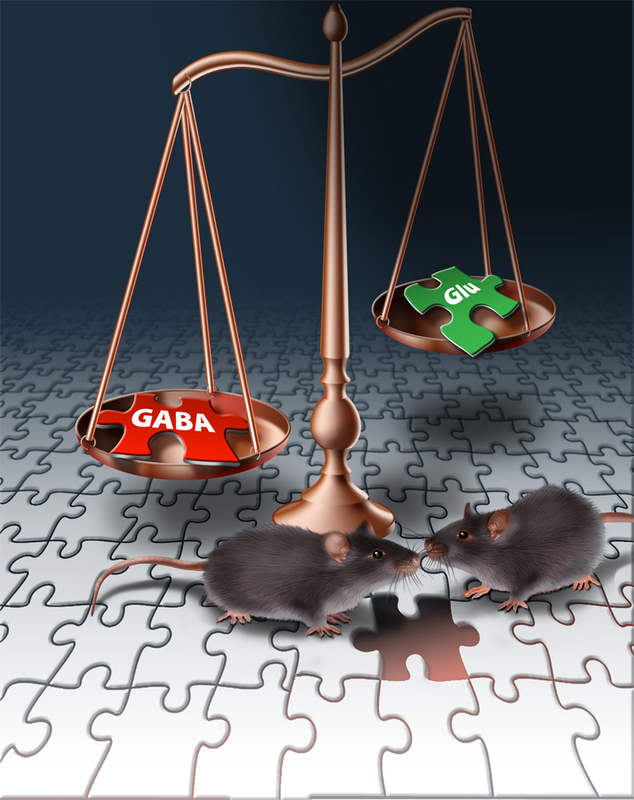 The results reported by Catterall and his colleagues suggest that augmenting the activity of opposing, inhibitory neurons could be an alternative strategy. Clinical trials of classical benzodiazepines and next-generation drugs that have a similar mechanism of action are now needed to determine whether the researchers’ findings in mice are relevant to humans. Astra-Zeneca and the National Institutes of Health have initiated one such trial. Contributors to the research also included postdoctoral fellows Sung Han and Chao Tai, graduate student Christina Jones, and research professor Todd Scheuer, all of UW's Department of Pharmacology. The research was supported by the Simons Foundation, the National Institute of Child Health and Human Development ( P30HD02274), and the National Institute of Neurological Disorders and Stroke of the National Institutes of Health (R01NS25704). Related earlier research from the Catterall lab. News editors: To interview members of the research team, please contact Kim Blakeley (206.685.1323, krb13@uw.edu) of UW Medicine Strategic Marketing & Communications. Here is a copy of the embargoed journal article.